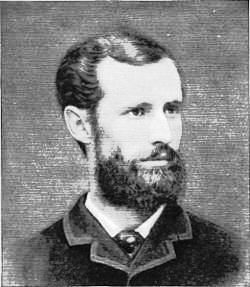 Clifton E. Mayne. From Omaha Illustrated (Omaha, 1888) (at left). “Quite an exciting scene was witnessed last evening, on the river bank just opposite Boyd’s packing house,” said the Omaha Daily Bee on January 23, 1882, “which came near resulting very seriously.” An accident victim, rescued from a fall through Missouri River ice in a “Narrow Escape,” was a horse. The owner, Omaha businessman Clifton E. Mayne, also slipped into the icy water but managed to extricate himself and summon rescuers for his drowning horse. Like other travelers, Mayne was accustomed to crossing the Missouri on the ice when it was frozen over during the winter, and he was returning across the river to Omaha from Council Bluffs when the accident occurred. His horse, a valuable animal he had named Oscar Phelps, was hitched to a light buggy. When part way over, he saw a group of boys who were ice skating “making violent signs at him,” one of whom warned him that he was about to drive onto a patch of thin ice. 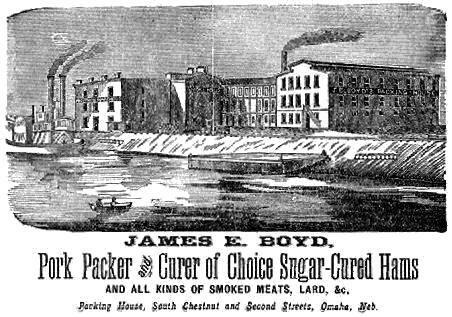 Men from Boyd’s packinghouse near the Missouri River helped rescue Oscar Phelps. From NEGenWeb Archives.